All M2M amplifiers and repeaters listed below are compatible with your Telus service. Telus M2M Signal Boosters for use in ATMs, lotto & vending machines, remote monitoring systems, etc. Telus signal boosters for machine to machine applications maintain cellular connections between computer terminals. If you are interested in a Telus signal booster for M2M, there are a variety of products to choose from. These M2M (machine to machine) boosters can enhance your Telus network connected devices in a variety of ways. Furthermore, regardless of the specific device you are using, and regardless of which Telus network your device utilizes (3G or 4G), you can find a signal booster that meets your needs. All of these signal boosters are designed to maintain signal strength between computer terminals. However, there are slight differences to consider. To that end, you will want to make sure that the product you purchase is designed to suit your specific needs. Telus Mobility is the second-largest cellphone provider in Canada. It was also the company responsible for establishing the first network in Canada, which currently offers the second fastest wireless network in the developed world (behind Denmark). Since 1982, Telus Mobility has worked to remain on the cutting edge of wireless network services, mobile devices, smart phones, tablets, and much more. As of this writing, the company continues to work to provide revolutionary products and services that are designed to bring Canada and the world into a new age of connectivity. Currently, the company offers a range of products, several network options (including HSPA+ and 4G LTE Advanced), and other services related to television, Internet, and home phones. They also offer a number of physical retail locations. Through Telus, you can shop for the latest products from companies like Apple and LG. You can then subscribe to the network that will best suit your needs. Telus provides solutions and services to both residential and commercial interests. If you have a device on a Telus network, you are already taking advantage of one of the most powerful networks in the world. With a Telus signal booster for M2M, you can make a good thing even better. These boosters provide considerable muscle for ensured, consistent network strength. 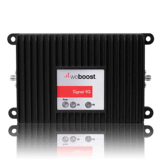 There are signal boosters for virtually all needs and sizes. With Telus signal boosters for M2M needs, you are talking about something that is designed to work with a variety of different machines. These machines include fleet telematics, ATMs, vending machines, asset tracking devices, and even remote monitoring control systems (think of something like a monitored alarm). If you want to take full advantage of your Telus 2G, 3G, or LTE 4G networks with these machines, you can definitely benefit from the use of a Telus signal booster for M2M. • Signal 4G Telus reception booster for M2M applications. Keep in mind your current network demands, when shopping for a signal booster. There are a few other considerations you are going to want to keep in mind, but ultimately, your network will prove to be the biggest deciding factor. You will also want to keep in mind the specific uses you plan to have for your device, as certain signal boosters are designed for specific demands. • Security 4G: This booster is designed to address any 3G or 4G data concerns you might have. However, this product is also specifically designed to work with security systems. The types of security systems that can take advantage of this booster includes alarm systems, door-entry systems, or any other type of security environment you can imagine. One of the most significant benefits to this particular booster is its ability to provide an extra two hours of battery life for areas in which the signal is weak. This device ultimately gives you the ability to have a security system installed according to the best place in which to install it, and not necessarily the place with the strongest signal. • Signal 3G (Direct Connection For M2M Installations): This direct connection kit provides invaluable M2M solutions for those who are operating with a 3G Telus network. Vending machines, cash dispensers, and similar business equipment can utilize this easy-to-install, easy-to-use kit. • Signal 3G (Direct Connection With Magnet Antenna): The magnet antenna associated with this specific 3G booster for Telus 3G networks makes the booster ideal for small space needs. If you need to have a device that is installed away from the view of the general public, or if you simply lack a lot of significant space for signal booster installation, this product can prove to be ideal. This product can work nicely with a vending machine, a cash dispenser, fleet management, or any other type of commercial equipment you can imagine. • Signal 3G (Direct Connection With Hardwire Kit): The most significant difference between this Telus signal booster for M2M and other products is the fact that it comes with a hardwire kit. Make sure this is something you know you are going to need, as it includes a DC hardwire power supply. This product can provide significant signal enhancements for 3G networks, and it can be used in conjunction with vending machines, cash dispensers, and more. • Signal 4G (Direct Connection For M2M Installations): This direct connection kit can substantially enhance your already-powerful Telus 4G LTE Advanced network. You can use these boosters to optimize the 4G capabilities for your network that powers a vending machine, a cash dispenser, or a similar piece of equipment along those lines. Lottery machines can also take advantage of one of these boosters. • Signal 4G (Direct Connection With Hardwire Kit): If you know you are going to need a hardwire kit for your 4G Telus network signal booster, then this is the product for you. Not only can this direct connection kit enhance a variety of machines, such as vending machines, lotto machines, cash dispensers, and more, but it can provide significant optimization for your existing Telus 4G LTE Advanced network. Furthermore, it is worth mentioning that this booster is capable of providing a 15 dB gain.